The Vigil Honor is the highest honor that the Order of the Arrow can present its members for service to the lodge and council. It dates back to the year 1915, when OA's founder, E. Urner Goodman, became the first Vigil Honor member. Since then, thousands of members have been given this honor. Once an Arrowman has been Brotherhood for at least 2 years, he (or she, in the case of adults) may be considered for Vigil honor by the Lodge members. Generally, only 2% of the Arrowmen in a Lodge will achieve Vigil in any year. 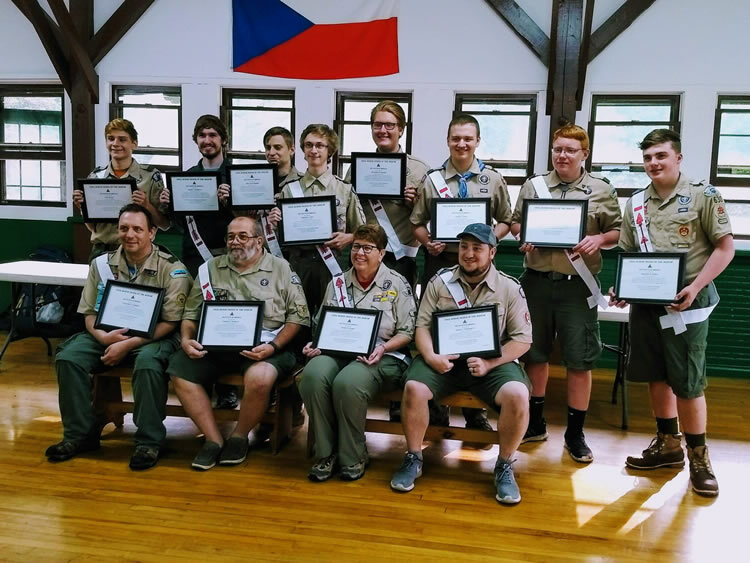 It is a high mark of distinction and recognition reserved for those Arrowmen who have given exceptional service, helping others beyond the call of duty involving personal effort and unselfish interest to one or more of the following: their lodge, the Order of the Arrow, their Council, Scouting, or their Scout camp. Under no circumstances should tenure in Scouting or the Order of the Arrow be considered as ample reason for a Vigil Honor recommendation. Alertness to the needs of others is the mark of the Vigil Honor. This calls for an unusual awareness of the possibilities within each situation. Vigil Honor members have a time-honored tradition to uphold. As leaders, they must conduct themselves in accordance with the ideals of Scouting and the Order of the Arrow.